Although located in the quaint, suburban town center of Media, Azie restaurant is hardly rural. This study in globalization brings a very urban vibe to this “small town.” Executive Chef Takao Iinuma and Chef de Cuisine Kazuyuki Mitsui, both formerly of Morimoto, present Japanese inspired cuisine with a refined blend of flavors from cultures around the world. Using top-notch ingredients and traditional Japanese cooking philosophies, Azie showcases fusion cuisine. Dishes like Rock Shrimp Tempura sit side-by-side with Salmon and Yellow Tail Ceviche, Whitefish Carpaccio and Pan Roasted Halibut. French Champagnes and Italian reds are available, but you can share the spotlight with sake and Rangpur Gin martinis. | Happy Hours 5 p.m. - 7 p.m.
| Dinner 5 p.m. - 10:30 p.m.
| Brunch 11 a.m. - 3 p.m. 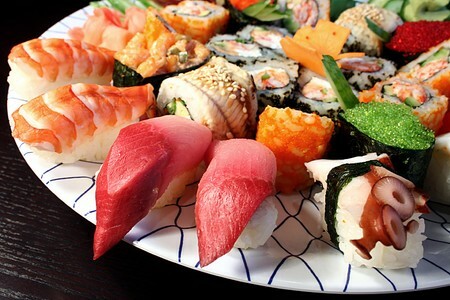 Yes, Sushi rolls are available on the dinner menu, lunch menu and the bar menu. Yes, There is live music every 2nd and 4th Thursday of the month from 7:00PM until 10:00PM.